Tips to help you get ready for Christmas! It’s November… which means it isn’t long until Christmas! 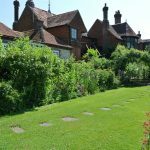 With diaries filling up, presents to get, and places to decorate we’ve put together eight tips on how Gilbert White & The Oates Collections can ease the festive rush! No really! We can’t wait to share with you our Gilbert White Gin No. 3 which will be available in December! The gin is limited edition and can only be got in Selborne, so perfect as a present for the person who has everything, or for a cheeky gift for yourself. Back due to popular demand we are holding our Wreath making Workshop over two days (Sat 25th & Sun 26th) . 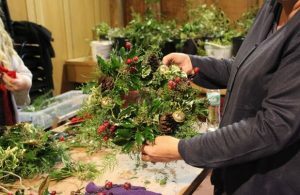 Rosemary Lanning will once again lead the workshop, where you will be able to make your own unique festive wreath; tickets (£40) include a lunch and admission to the museum. Our shop is known as a great place to come for presents! With lots of choice of beautiful one off gifts, home-ware, accessories and books. Our shop is well worth a visit to tick a few people off of your Christmas list. We are open until 3pm on Christmas Eve for any last minute emergencies! As we enter December we are looking forward to Mulled Wine Weekend (2nd & 3rd) The event is free admission, with our favourite choirs, games, crafts and wassailing… not forgetting of course the Mulled Wine! We sell festive crackers, napkins, advent calendars as well as handmade Christmas decorations in our shop! We will also sell mistletoe from our garden! On Sunday 3rd December we are holding a concert in the Great Parlour at 7pm, presenting TOBIAH with special guest Colette O’Leary Are We Angels . TOBIAH, known for her ‘Beautiful and natural voice’ (BBC Radio Sussex), poignant lyrics and touching hearts with life-affirming stories of love and endurance, will be joined by acclaimed piano accordionist, Colette O’Leary, whose virtuosity delights audiences worldwide. 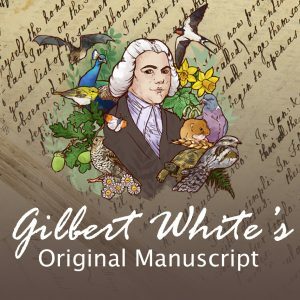 The atmosphere of Gilbert White’s Great Parlour, decked in its Christmas finery, will provide a magical and intimate setting, perfect for TOBIAH’s music. Tickets are £15 and must be booked in advance as seating is limited, with space for just 35 guests. We do hope that you will join us for complimentary mulled wine and mince pies before the concert. We love our festive treats here at Gilbert White’s we always have some good baking! Why not pop into our pop up café and try some homemade festive treats or try and win our Christmas cake at Mulled Wine Weekend! On Saturday 9th December Quantum Theatre returns this year with a brand new production ‘The Nutcracker and the Mouse King’, these family productions have been delighting Selborne audiences for the last couple of years, tickets are from £9.50 for both the matinee and evening performance up at the barn. When Dr Drosselmeyer, brings the Stahlbaum family a Christmas present Marie is captivated by the little nutcracker. But after everyone has gone to bed, with the chiming of the grandfather clock strange things begin to happen. Why are the dolls all coming to life? And why are mice pouring up from beneath the floorboards? As the monstrous Mouse King orders the attack Marie fears the worst but, harnessing his toy troops, the Nutcracker, leads them bravely into battle… Will they win through and can the evil curse on the Nutcracker be broken? Find out in Michael Whitmore’s captivating new adaptation of the ETA Hoffman Christmas classic, an enchanting mix of magic, music and love-conquering-all for all ages. Your ticket for the: Tips to help you get ready for Christmas!